There's no better way to tie a bedroom together than with a full bedroom set. Whether you're buying a new house or you want to spruce up your existing bedroom, investing in a bedroom set is the best way to provide yourself with a comfortable sleeping environment that you'll treasure for years to come. King bedroom sets are the most luxurious types of bedroom sets available, and these furniture combinations avoid leaving style to chance by ensuring that every piece in your bedroom matches. However, there are so many different types of king bedroom sets to choose from that a home decorating novice might become overwhelmed with decision anxiety. Not to worry; we're here to clear the air with a comprehensive guide that will tell you everything you'll need to know when it comes time to pick a king bedroom set for your very own bedroom. Coastal bedroom sets borrow their aesthetics from the types of furniture that are commonly included in beachside bungalows. These sets include plenty of maritime-themed accessories, and they often incorporate components like weathered wood and seashells. It isn't uncommon to find pictures of seahorses and crustaceans in bedrooms that have been designed in coastal style, and coastal bedroom sets generally seek to complement this sea-life theme. Some coastal bedroom sets go so far as to include genuine-looking sea chests, and almost all of these sets incorporate light blues, whites, and sea-greens into their color schemes. Cottage-style king bedroom sets draw their inspiration from the quaint cottages that dot the countryside of Britain and New England. These bedroom sets usually have open, breezy designs, and they make copious use of the color white. Cottage-style decor is usually relatively sparse, and whatever wall art you find in a bedroom decorated in this style will be unobsequious. Cottage and country bedroom sets may make use of antique furniture like hardwood vanities and weathered chests, and they also might include vintage rugs and wood-paneled walls. In terms of materials, these bedroom sets almost always use real wood instead of particle board, and metal furniture is nowhere to be seen in country bedroom sets. Glamorous king bedroom sets seek to evoke the aesthetic of a presidential suite or a queen's bedroom. These bedroom sets spare no extravagance when it comes to crystal, silver, and faux gems, and glamorous beds might make use of intricate scrollwork on their headboards. Traditional footed furniture is also a must when it comes to glam king bedroom sets, and you might even come across a four-poster bed or two in your search for the set of your dreams. These bedroom sets make use of a lot of muted tones, and including at least one chandelier is practically mandatory. Industrial king bedroom sets are all about function over form. These simple sets borrow their style from industrial settings, and they may incorporate exposed wooden slats, metal slabs, or furniture constructed from metal. Industrial sets generally include beds without headboards, and these beds may be built on platforms that are designed to insulate them from cold, concrete floors. In some cases, recycled wooden pallets may be used to make industrial beds, and these king bedroom sets usually include fewer pieces of furniture than other set styles. 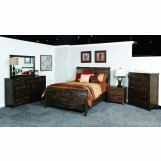 Contemporary king bedroom sets observe the essence of postmodern style. Postmodernism is all about deconstructing archaic or traditional artifacts and mixing them with the cutting edge of cross-cultural aesthetics, and contemporary bedroom sets certainly don't disappoint. While these types of king bedroom sets may incorporate traditional four-poster beds, they also use simple, flowing lines and follow minimalist themes. All sorts of different colors are used in contemporary bedroom sets, and these sets usually include the full retinue of furniture pieces that generally accompany a king bed. Rustic king bedroom sets bring back the essence of days past. Some of these sets might be designed to mimic the lines and features of a hunting cabin in the woods, and others might cause their occupants to reminisce about farmhouses in the country. However, just because rustic bedroom sets mimic the decor of simpler times doesn't mean that these sets are overly simple. These traditional king bedroom sets can actually be quite ornate, and they frequently incorporate leather, hardwood, and even marble in their composition. The "traditional" in "traditional king bedroom set" can mean quite a few different things. To some decorators, this term might refer to the aesthetics of Victorian England, but others might consider a bedroom traditional if it mimics the appeal of an American upper-middle-class bedroom from the middle of the 20th century. Traditional bedroom sets are almost always ornate, and many of them incorporate wallpaper that complements the vintage, refurbished pieces that comprise these classy furniture collections. Sleigh beds are beds that follow a traditional style that's seen in most king bedroom sets. These beds derive their name from their shape, which mimics the appearance of a sleigh used for travel in the snow. Sleigh beds have high headboards and low footboards, and they are usually made from hardwood or fiberboard. Some sleigh beds have ornate designs, but others are plainer in appearance. Most king bedroom sets include two nightstands. These pieces of furniture are usually identical, and they are designed to be placed at either side of the bed. Nightstand styles vary immensely, but they usually include at least two drawers each. These drawers can be used to hold books, glasses, or other items, and some people even store small articles of clothing in their nightstands. These pieces of furniture have flat tops, and these tops are common places to put lamps, photo frames, or glasses of water. In general, nightstands are designed to match a particular king bedroom set, but audacious interior designers may pick a nightstand style that clashes with the rest of their bedroom furniture for dramatic effect. Dressers are integral components of king bedroom sets. These furniture pieces are usually long and low, and many of them have feet that raise them up off the ground. The dressers that are contained in king bedroom sets have at least five drawers, and many of them have even more drawers. The drawers in some dressers are arranged in a single vertical line, but other dressers used in king bedroom sets have two sections of drawers that are parallel to each other. Since dressers have flat tops, they are commonly used as stands for picture frames, knickknacks, or toiletries. While the most common material used in the construction of dressers is solid wood with wood veneers, other materials such as medium-density fiberboard may also be used. In addition, some dressers have marble tops, and others have leather or faux leather fronts. Vanities traditionally have tall, narrow mirrors that are used for applying makeup or other grooming tasks. Some dressers incorporate this aspect of vanities by including a mirror, but many king bedroom sets have both a dresser and a vanity. Like dressers, vanities usually have drawers, but the drawers in vanities are much smaller than those found in dressers, and they are usually used to hold toiletries, makeup, and brushes or combs. Some vanities also come with stools or small chairs that are designed to hold your face at an optimum height in front of the mirror. In addition, vanities may have multiple mirrors on hinges that can be moved to view your face from multiple angles. Chests are probably the furniture item that is least commonly found in king bedroom sets, but many sets include chests nonetheless. Traditionally, these furniture pieces were designed to mimic the type of traveling chest that was used to store clothes in generations past. However, many chests that are incorporated into bedroom sets nowadays have been significantly stylized, and they may feature leather construction or even marble tops. In addition, some travel chests are made from polished or rustic solid wood, and they may include drawers. Solid wood is one of the materials that are most commonly used in king bedroom sets. While solid wood is a relatively expensive material, it is very durable, and it looks good and feels great to the touch when it is covered with a thick veneer. While light woods like pine are used in some bedroom components, other sets incorporate hardwoods like oak or mahogany. Fiberboard, which is somewhat more durable than particle board, consists of tiny fragments of wood that are pressed together and solidified with a solvent. This material is easy to make, and it is lightweight. However, it isn't as durable as solid wood, and it is generally only used in pieces of furniture that don't bear much weight. Many modern bedroom sets incorporate some degree of metal. Some bed frames are made entirely of metal, and aluminum and stainless steel are the types of alloys that are most commonly used in bedroom furniture. Some bedroom sets don't incorporate any visible metal, but they instead use steel as a solid backing to shore up less-durable materials like MDF. Traditional and glamorous king bedroom sets often include marble. Whether this marble is real or fake, it is used to line the tops of vanities and dressers. In some cases, marble may even be incorporated into some aspects of a sleigh bed. The place that you're most likely to encounter leather in a king bedroom set is in a chest. In some cases, leather or faux leather may also be used to line a sleigh bed. Some sleigh beds use leather in their headboards, and these headboards often incorporate buttons or other rivets that keep this soft material in place. Now that you understand the rules of the game when it comes to picking out a king bedroom set that will fit both your existing interior decor and design dreams, you're one step closer to finding a set that will make you proud to go to sleep at night and excited to wake up in the morning. When it comes to choosing a new furniture combination for your bedroom, there are no right or wrong answers, but you can take pointers from people who have been down this path before. As you put together your perfect king bedroom set, don't be afraid to mix and match the various styles and components that give each style its unique and appealing flair.